If your job as a notary public requires you to operate at a large volume or fast pace so that you don't have time to deal with a stamp an additional ink pad, a Self Inking Notary Stamp is absolutely perfect for you. The advanced spring-loaded technology allows for a gorgeous and clean impression every time guaranteed. These self inking notary stamps come in a variety of colors and can be re-inked to last for thousands of impressions! Unsure if this product is the best one out there for you? Contact us! 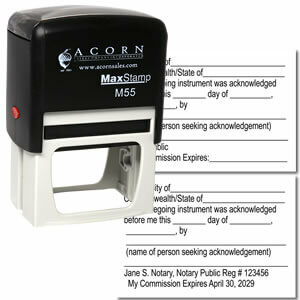 We would be happy to talk about a personalized notary stamp that fits your wants and needs perfectly. 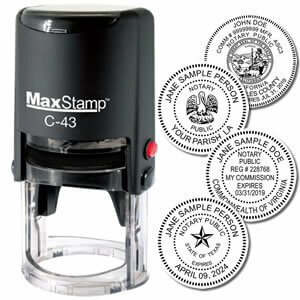 Made of heavy-duty and durable synthetic materials, this Self Inking Round Notary Stamp is a work horse. Sized to fit your 1 5/8" state approved seal perfectly, this stamp comes with a top for easy storage and a mess-free travel experience. Custom dies cut for your specific needs are carefully attached before being rigorously tested to assure customer satisfaction. Many states allow the use of the state seal to be included on your notary stamp. State board permitting, this lightweight yet extremely hardworking Self Inking Rectangular stamp can display your state's seal with unbeatable quality and just a flick of the wrist. Created to fit within smaller margins of documents without obscuring important text, this compact stamp is a must-have for all notaries! Some notaries authenticate hundreds of documents a week. With the need to acknowledge understanding of the document by the signer, this Self Inking Notary Acknowledgment stamp is a great addition to a notary's supplies. With ample room to write the required information, we fully recommend this sturdy supplemental stamp for any notary - bustling or not. Documents that require an oath or affirmation must have a notary present to witness the signing. After a notary has confirmed the oath or affirmation, he or she must authenticate such proclamation on the document. 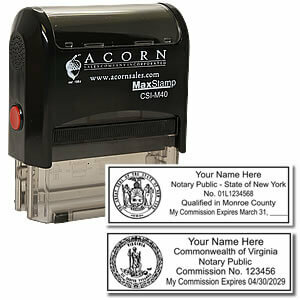 With this Self Inking Jurat Stamp, you can be sure to not leave anything paramount out that is required by your state. Made of heavy-duty plastics and a rubber die, this Jurat Stamp will prove to be extremely useful. Without the proper tools, some jobs are near impossible. Don't feel that way when the Self Inking Notary Certified Copy Stamp is now available. 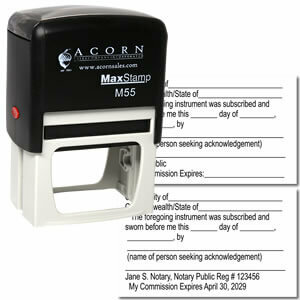 This Self Inking supplemental stamp allows you to neatly demonstrate that you have certified all copies of any original documents created under your supervision as a notary.